For the same price as a 1.0 litre VW Take Up!, you can buy a 1.3 litre 5 door airconditioned Perodua Myvi with Wolfrace 17" alloy wheels. 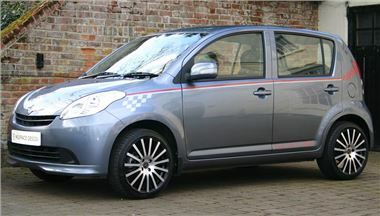 Only ten of this very limited edition Myvi will be built, fitted with striking 17” Wolfrace Brooklands alloy wheels along with a silver and red graphics kit including stripes along both sides of the vehicle, with chequered flags, Wolfrace Design logo to the rear doors and Wolfrace logo on the tailgate. Exclusive black and silver Wolfrace Design front entry guards will also be featured which will be individually numbered from one to ten. This is in addition to the high standard specification seen across the Myvi range which includes air conditioning, four electric windows, electrically adjustable door mirrors, power steering, integrated radio/CD player and much more. All owners of a Myvi Wolfrace Design limited edition will also receive a free Wolfrace travel mug courtesy of Wolfrace Wheels (UK) Limited! Just ten people will become the owner of a limited edition Myvi Wolfrace Design which is available for only £7,999. There will also be the option of a luxurious sport style leather/alcantara interior for an additional £1,000 which will further enhance the vehicle’s appeal. Available with manual transmission only, the Myvi Wolfrace Design will be available in a choice of either Ebony Black or Medallion Grey, both of which are metallic paint finishes provided at no additional cost. OTR price includes 6 months tax (£66.00), first registration fee (£55) and £1,000 retail incentive. Retail incentive offer valid until 30th June 2012.